Decorating the venue is an endless chore, so many different options and designs, colours, flowers, sashes, chair covers.. The list goes on. This is a top five count down of the most useful and cost effective ways of ensuring your room is decorated sufficiently to look as if your budget is within the ranges of the stars like the Beckhams and The Cruise’s. Flowers are such an important part of the wedding and the decor, they have ability to make a boring lifeless room turn into a colourful and zesty paradise. Matching and completmenting the flowers with the theme of the wedding will add impact to your guests and your photographs. Depending on the type of flowers you choose will affect the price, the bride’s bouquet can easily be priced at £70 and higher. In 2000 Jennifer Aniston married dishy actor Brad Pitt, (whom is on his second divorce from Angelina Jolie this past week). They had wanted a grand wedding and chose to import in an estimated 50,000 flowers, at a high cost with the wedding costing over 1 million. It’s clearly not necessary to go to this extent with your flowers however reaching a nice balance that can change the room from drab to fab is ideal. Little details in the wedding favours or behind the chair covers can really have a tremendous effect on the decorations. Cost cutting mechanisms for this would rely in using seasonal flowers at the time of your wedding, picking flowers that have strong colours rather than design can also cut costs. Spread out the flowers with greenery or “fillers” to make less seem like more. 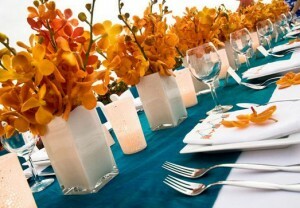 Ways in which you can cut the costs of table decorations is through do it yourself methods. 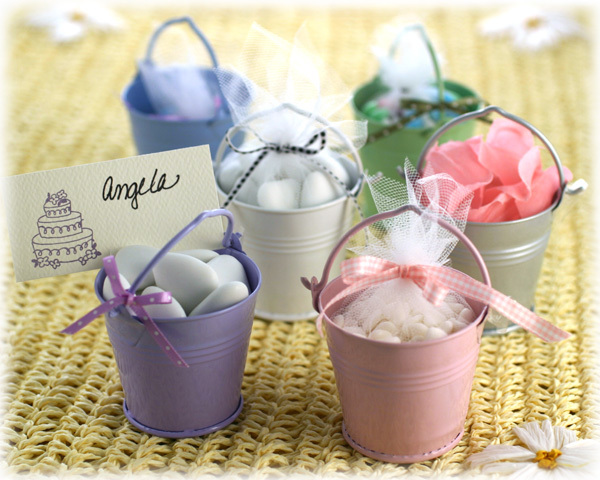 Involve creating your own organza almond bags for the guests, simply get down to a arts and crafts shop, purchase a few meters of your themed organza colour, get a few friends, some bubbly, scissors, loads of coloured sting and get bagging the almonds. Its a simple and incorporating some friends and bubbly makes light of a repetitive task, and again its a personalised touch at a low price for your wedding. The use of dim lights in the reception can add a real soft and effective ambiance to the room, a upcoming trend is to have a backdrop of lights behind the high table. Its great for atmosphere and dramatic photographs of a candle lit dinner. The great thing about candles and fairy lights are the price, it can change the appearance of a room with a simple flick of the light for the price of economically beneficial tea candles. Its also fantastic idea to get scented candles, such as vanilla which can add a beautiful welcoming fragrance in the room for your guests. The candles can easily be turned into a dramatic center piece simply by purchasing some large bowls adding water and then allowing the candles to float. It is important to remember your venue and if you have the ability to shut out the natural light otherwise the candles loose their value if the room is brightly lit by the sun!. 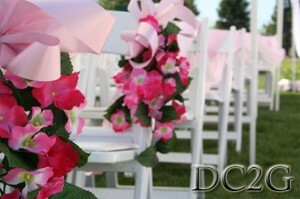 Wedding Chair covers have the ability to transform a humble room into a high class, sophisticated beautiful reception. The chair covers simple in theory but major in results make decorating the rooms a piece of cake. Its a quick and easy way of adding value to the wedding and its appearance. Always available in a variety of colours, designs, styles your personal flavour could never be ignored. Working on your own personal theme that you have adopted for your cake, and dress the chair covers should compliment this. Wedding chair cover hire transforms the appearance of the humble chair into a high class, sophisticated addition to your wedding, conference or event. If you are on a budget it is possible to mix and match and simply just use a wedding sash on its own, or just an exclusive wedding chair cover. Previous articleMr and Mrs Smith no more!! I want to thank the blogger very much not only for this post but also for his all previous efforts. I found designerchaircoverstogo.com to be very interesting. I will be coming back to designerchaircoverstogo.com for more information. I really enjoyed this post. That is always nice when you find something that is not only informative but entertaining. Excellent. I just book marked your blog on Digg and StumbleUpon..